Keeping your tools free of rust can be a chore, especially in humid zones. 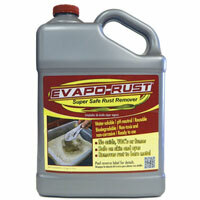 No matter where you live or how much hard use you put your tools through, there is a rust removal solution. Your options range from using harsh chemicals and lots of elbow grease to biodegradable rust removal. If you like to see science in action, there’s even a method that will show off your science skills. This solution is designed to dissolve rust by immersing the rusted item from 4 to 8 hours, but longer periods may be necessary with heavy rust. After soaking overnight, rust should wipe off, or scrub with a stiff brush. This is a safe, biodegradable alternative to harsh chemicals, but may require multiple applications for effectiveness. This product has a huge following among many professions… from woodworkers and machinists. Give the 32oz bottle a try or the 1 gallon jug for a better deal. Rust converters and neutralizers will remove rust with little physical effort, but they also tend to leave a rough finish that must be worked before painting. Some converters are promoted as drying into a paintable finish, but using an actual primer coat provides better results. Rust converters require quite a bit of time, but little physical effort. The biggest disadvantage is that they pock the surface of the metal being cleaned, so should not be used on heavily rusted or measurement sensitive devices. While it is a long and somewhat involved process, a vinegar and salt solution can be used as a long soak for rust removal. An alternative to using vinegar is to use lemon juice instead, adding salt for additional acidity and rinsing in a baking soda solution when done to neutralize the acids and work hard rust deposits loose. You can also rub lemon or lime directly on lightly rusted areas for quick removal. For large projects citric acid can be used in place of juice. Check out this amazing thread which shows some great pics of the salt and vinegar in action. In addition, Epic Gardening explains an easy way to remove rust from tools using vinegar. If you want to do some serious rust removal, you can use a large basin or tub of water, a battery charger and washing soda. Baking soda is a different chemical compound, so make sure that you use washing soda. You will also need a piece of iron that can be sacrificed for the removal process. Not only is this a very effective method, it also make a wonderful science experiment for your kids. 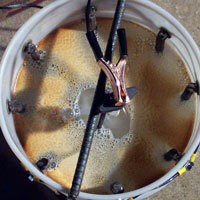 Here’s a good guide on electrolytic rust removal (link). Apply kerosene as a penetrant, and allow it to set for 1 to 4 hours. Using an adjustable speed cordless drill and a fine grit abrasive pad, buff the rusty service at low speed (around 500 rpm). The finer the grit you use, the less potential for scratching of the metal. Instead of kerosene, you can use a commercial penetrant such as WD-40. Avoid the use of heavy penetrants such as acetone. Since these chemicals are also used in paint removal, they are not recommended for any type of painted or sealed finish. Be sure to wear protective eyewear, gloves and provide for proper ventilation. Once you have removed the rust from your tools, put some thought into preventing them from forming it in the future. There are a number of sealants available that will keep your tools looking like new and clean and shiny for years, but the very best method is simply to always clean your tools and store them in a warm, dry location. Also, keep those silica packets that are found in a variety of products you buy and toss them in the drawers of your tool chest to help absorb any moisture and keep rust away.